The day is approaching in which everyone is Irish! To some Saint Patrick’s Day is about parties and enjoying life to the fullest. To others it is a day to celebrate Saint Patrick, the Patron Saint of Ireland and numerous other countries. This week’s blog is dedicated to Saint Patrick and how he is perceived in different places around the world. Of course we have to start with the country Saint Patrick is most associated with. When I was in undergrad I went with my school on a trip to Ireland, England, Wales and France. Our tour director had us take an unplanned trip to Rock of Cashel while there. 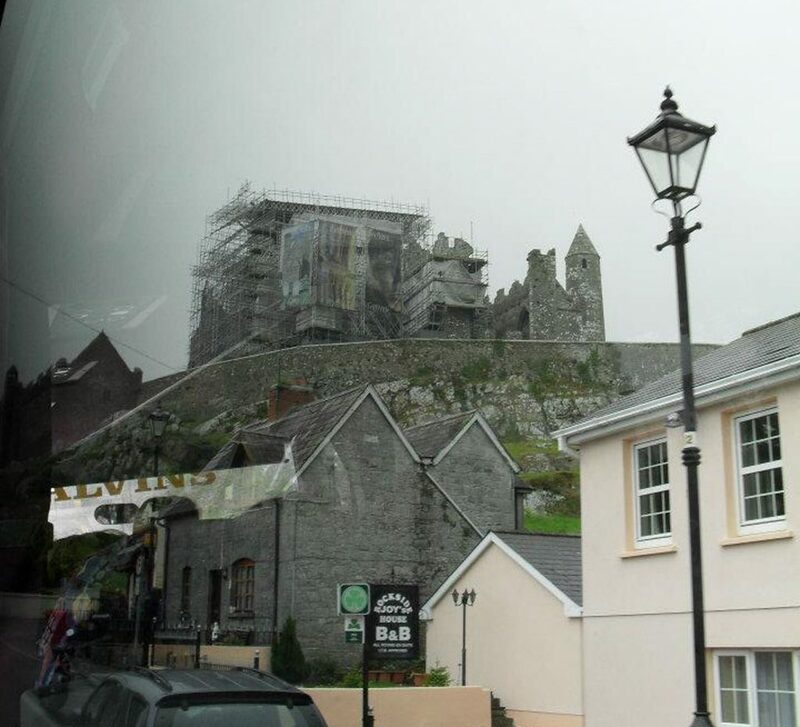 Rock of Cashel is by a cave where Saint Patrick banned Satan from entering. In the 12th Century a Cathedral was built there. As you can see from my picture, we visited when they were preserving the structure. We were still able to see the importance of this cathedral to the Irish. This is the burial place of Saint Patrick. He is buried at Down Cathedral which is located in the town of Downpatrick. He was most likely buried there because he is regarded as the first bishop of the Diocese of Armagh. Down Cathedral is also part of the Church of Ireland. To be seen as a Saint of both the Catholic Church and Church of Ireland is a pretty special honor. Everyone may not be Irish here, but people love to celebrate one of our favorite Saint’s. Cities have grand parades and turn everything from rivers to their drinks green. We also enjoy a good Shamrock Shake! I’ve experienced New York City’s parade accidentally once – and yes that can happen. It runs up 5th Avenue, and if you are there the wrong Saturday you too can be stuck in it. If Saint Patrick’s Day is on a Sunday like this year, the parade will be on Saturday the 16th. They even have mass at Saint Patrick’s Cathedral that morning, but you have to purchase a ticket first! Chicago is known to dye the Chicago River green in celebration! This draws on average 400,000 spectators each year. Then again, their annual parade helps draw in the tourists as well! Many small towns across the globe have different festivities this weekend. Since Saint Patrick’s day is a Sunday this year, that means there will be less traffic going to work Monday morning (hopefully!). Just keep in mind that Saint Patrick is the Patron Saint of Ireland. You can donate an offering to your parish in honor of Saint Patrick, and you can do so by using Parish Giving! Give us a call or email if you have any questions! You may remember one of our previous blog entries about Vacation Bible School, or VBS for short. We discussed why we have it, but many have asked about the history of VBS. Let’s take a stroll down into the past and see what we can find out about the history of Vacation Bible School!